The Residents of 2Hopkins’ apartments in Baltimore, MD, have plenty of space to use as they choose. At 2Hopkins apartments in Baltimore, MD, we believe in expansive space. We want our residents to enjoy the best of downtown living and that includes having ample space for everything that makes up your lifestyle. As you enter our doors, you’re greeted by a grand lobby entrance, which features sky-high ceilings and a wide-open space. In the open space, there’s seating available for you and your plus one to enjoy chitchat over a cup of coffee without worrying that everyone can hear your conversation. Our mailboxes and refrigerated packaging system are tucked away just off to the side, with a large table for preparing or sorting any mail you may have. The abundant space continues as you take our elevators to your individual residence. You have your choice of a studio, one-bedroom or two-bedroom floor plan, each of which provides you with the room you’ve been craving – including a walk-in closet, so there’s enough space for all of your clothes, shoes, bags and whatever else you want to hide away. If you happen to have even more belongings to stow, we also offer additional storage on every floor. But it doesn’t stop there. Head up to the 21st floor and you’ll find even more spaces to take advantage of. Aside from our luxury penthouse suites, there’s also a fitness area, a spin/yoga room, a large social space with a kitchen and banquet area, and a lounge with tables for playing games, as well as two secluded sitting areas with beautiful Baltimore skyline views. And that’s STILL not all there is! Because in addition to all that we’ve already mentioned, all of your modes of transportation have a secure place to live with our on-site garage parking and bike storage. 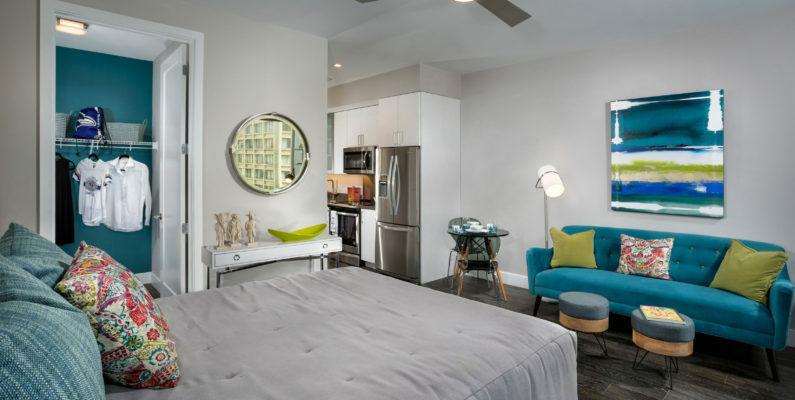 When you’re looking for apartments in Baltimore, MD, choose one that prioritizes your space and fits your downtown lifestyle. Schedule a tour of 2Hopkins today!